Selling online requires a flexible, scalable database to hold information about all your products, and to display that information on easy-to-find web pages. Our merchandise catalog system gives you a versatile, reliable way to display all your products, customized to emphasize their special features. Driven by industry-leading SQL Server technology, the catalog can easily be managed through simple forms that run in a web browser. For the maximum control over your product inventory, an administrative control panel lets the site's owner manage the entire site. These controls run in off-the-shelf Microsoft Access software, the database component of the Office Suite's professional editions. Secure dynamic links connect this Access "front end," on any office computer, with the SQL Server "back end" on your web host's servers. 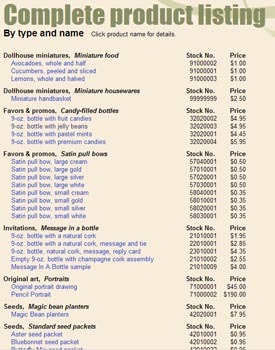 Catalog pages can be set up to sort by product name, number, category, or other characteristic. Products are fully searchable, too. This linked-database approach ensures that, no matter how much your product line grows, or your website's traffic increases, the powerful "back end" server technology can keep up with the demand. Features of an online catalog include product categories and sub-categories, management of images, both full-size and thumbnails, and the option of assigning descriptive amenities to each product. One use for this feature is to offer suggested uses, which can be used in site indexes and search features. The product database is fully searchable, so customers can easily find what they're looking for ... and products they hadn't even known they needed! 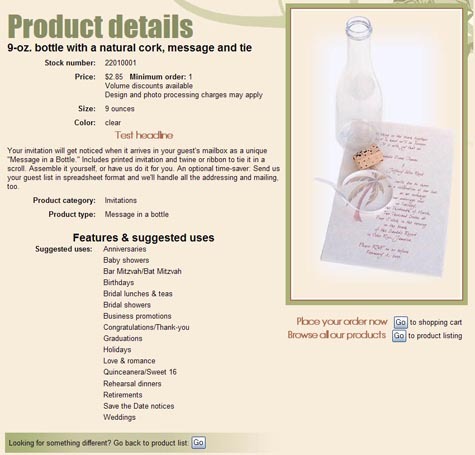 This is an example of a single-product page in our database-driven online catalog system. Product descriptions, images, prices and features are controllable through easy-to-use administrative pages, running in web browsers or MS-Office software.